Kathi Pelton’s new book is available today! Peace is vital for believers in this hour as we navigate today’s world of anxiety and confusion. But how can someone possess that quiet, inner assurance that comes from knowing God is intimately involved with every detail of their life? Jesus freely offers peace to us, but too often our experience of His rest is as fleeting as our changing circumstances. It doesn’t have to be that way. No matter your situation—whether you are in abundance or in great need; whether you dwell in safety or find yourself in the midst of turmoil—you can experience the joy that comes from living in peace. In this book you will encounter: • Real-life stories of struggle and triumph • Powerful, Bible-based promises of God’s peace • Keys for living in purposeful trust despite painful loss and disappointment • Tools to help you overcome lies that promote fear • Renewed assurance of the Father’s goodness in your life If you seek a path to genuine peace in the midst of our hectic culture, let Kathi Pelton be your traveling companion as she shares Scripture and candid personal experiences. Your journey to breakthrough can start today. An accompanying journal will also be available later today which will make your experience more personal and will engage you in a much deeper way with greater impact. We will post the link when it is available. 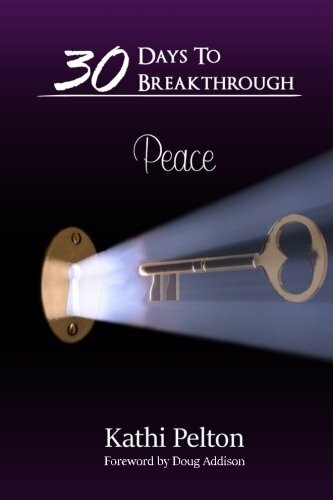 This entry was tagged 2015, 30daystobreakthrough, AbundantLife, breakingfear, breakthrough, Deliverance, Encouragement, faith, Hope, Jesus, kathipelton, liveinpeace, newbook, peace. Bookmark the permalink. So excited for this book! Just the cover says ALOT! Peace is so key! I am going to give these for Christmas gifts! Perfect timing! Thank you! Are the journals available? So amazing that Doug Addison wrote the forward! I love his ministry and yours! What a double blessing. Thank you.